Enshrined into official healthcare policy in 2010, patient satisfaction now carries serious implications for providers. Hospitals that fail to sufficiently satisfy their patients see significant cuts in their reimbursement for Medicare and Medicaid services. Hospitals have reacted the way any business would when it faces a serious threat to its revenues. They have started to devote more time and more resources toward satisfying patients, hoping that these efforts will drive up volume, and secure reimbursement from the Centers for Medicare and Medicaid Services (CMS). Predictably, patient satisfaction has become one of the most-discussed, most-debated, most consulted-on issues in healthcare. It’s become a hallmark metric of the age. HCAHPS, the CMS-mandated survey, suffers from a dismal response rate — as low as a 20% national average. Low response rates contribute to statistical uncertainties. Smaller pools of numbers mean more extreme — and less accurate — representations of any given provider’s reviews within the community. Additional problems stem from self-selection. Certain types of patients who choose to complete surveys have an outsized say in patient feedback. For example, older, sicker patients who see female providers are far more likely to respond to surveys than their peers. So, male providers who see young patients will see depressed survey responses, and get less accurate feedback. And that’s if a facility administers surveys in a uniform way across the board for every patient. The truth is, they tend not to. 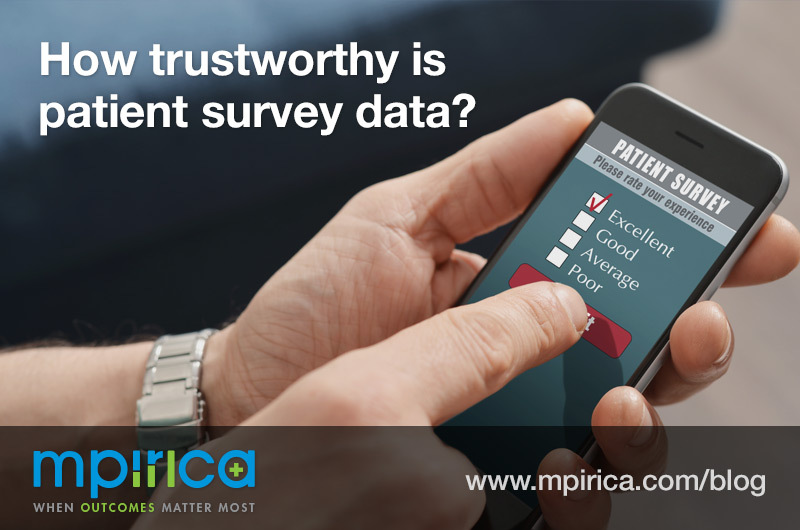 The way that surveys are given and assertiveness in follow-up frequently change, driving down the reliability of these surveys even more. A 2017 JAMA Study confirmed that patient ratings of specialist physicians have zero correlation with objective measures of quality, or with peer assessment of performance. Worse, a UC Davis study found that some patients have it precisely backwards. The study found that the most satisfied patients are more likely to be readmitted, have steeper costs, and are more likely to die in the hospital than their unsatisfied peers. But really, hospitals have no choice. If they want patients to come, and if they want to fend off CMS penalties, they have to keep patients satisfied. This explains the rise of valet-parking, custom-order room-service meals, flat-screen TVs in every room, and special lounges for privileged loyalty patients. These frills might make a hospital stay more pleasant. It’s hard to argue, however, that they do much for quality of care. Are they really the best possible use of a hospital’s limited resources? What if the money spent on fancy new TVs went toward hiring new nurses instead? How much would that improve employee morale and, ultimately, care outcomes? This points to another major problem — that the emphasis on the customer comes at the expense of clinical workers. Many doctors and nurses, already overburdened, must now go through exercises to develop their ‘customer service skills.’ While there’s some merit in focusing clinician attention on a patient’s experience, some of these programs are downright demeaning. “Scripting,” for example, entails nurses and physicians rote-memorizing pat responses to patient complaints. And if they deviate from script, the consequences can be severe. Health systems have started using patient satisfaction scores as a factor in calculating salaries for doctors and nurses. As if the stresses of clinical work weren’t demanding enough! Small wonder that 78% of clinicians report that these surveys negatively affect their job satisfaction — with 28% of them saying they’ve considered hanging up their stethoscopes for good. The effects of patient surveys can even interfere with care itself. Sometimes, patients can have impulsive demands that don’t at all relate to their treatment. Satisfaction surveys give doctors and nurses an incentive to pander. This has started to affect clinical decisions. Doctors, for example, may be willing to give patients a medically unnecessary test, or a certain drug, in order to keep the patient satisfied, even if the patient doesn’t need them. One striking example: in 2014, 48% of doctors reported prescribing inappropriate narcotic pain medication, because they had patient satisfaction scores in mind. Joshua Fenton, who conducted the UC Davis study above, points out that this isn’t how it should work. “Patients should be satisfied with their physicians, but ideally it’s because their physicians guide them toward the best care,” he says, not just because the physician gives patients what they want. The Atlantic piece concludes with a bombshell about patient satisfaction. The author, Alexandra Robbins, used objective outcomes data from Medicare to find some of the country’s worst-performing hospitals. These facilities produce more mortalities, more readmissions, and more serious complications than their peers. This is the real problem of patient satisfaction. HCAHPS scores divert attention from the real criteria we should judge healthcare systems by. At the end of the day, healthcare is about outcomes, not about ‘customer service’, and the metrics we use to evaluate hospitals should reflect that.